What Shouldn't We Expect from Our Cold Email Addressees? Self-Service in Cold Email — What Shouldn’t We Expect from Our Addressees? What can we ask our addressees for? What next steps can we plan for them to take after reading our message? What can we expect from them to do, and what would be too much? The CTA should be the final part of our message, but we should ask all those crucial questions even before we get about the copy. Here are some guidelines on how to find the answers to those questions. Of course, it would be wonderful if people were just flocking in their thousands to try our product or service. But that’s usually not the case. One email from a complete stranger may not be enough to click the link and sign up for a trial. We have to get into our prospects shoes for a moment and realize that. And we need to realize that being emphatic, tactful and considerate in our emails will get as further than expecting our prospects to start serving themselves after our first outreach. What can we ask our addressee for? In the CTA of our cold email, we may ask our addressees for many different things. Each option has its pros and cons, and we have to decide which way to go, having in mind all the pros and cons, but above all – having in mind our prospects. So what can we ask them for in our CTA? 1. Ask them to follow a link? That seems very convenient to us. We think to ourselves it’ll go like this: 1. we send an email with a link inside, 2. we ask the addressee to follow the link (and probably sign up somewhere), 3. the addressee follows the link and signs up for our free trial. Sounds perfect, doesn’t it? Well, it’s not a perfect solution. Why would I need it at all? Is my current solution not enough? They will also have dozens of questions to us considering the very solution. They will have doubts. But in our email, they won’t see an invitation to contact us and get answers to all those questions. They will see a link. Most of them will probably let the doubts and too many unanswered questions take control. Most of them will ignore the message. Some of them might think we sent them some stinky link and they will be afraid of clicking it. Some of them encouraged by our pitch will follow the link, but the doubts will eat them when they’ll be exploring our site. They won’t reply to our email, because that’s not what we asked them to do. And thus, we won’t be able to start a valuable relation with them. So, why did we send the cold email for again..? Don’t get me wrong, I don’t say it won’t work at all. It might work for some prospects. But it won’t work very well. And it’s not what I merely assume – we checked that in our own cold email campaign. At our previous project, we’ve been sending a cold email starting a conversation – no links, just a simple CTA: “If you’re interested, drop me a line”. And it brought us some amazing effects. Then, we changed the email – mainly because we started working on Woodpecker, and didn’t have time to carry on with all the conversations we had started. So we simply put a link in the email, and asked the addressees if they would be interested in what we have.We had some sign ups, but it was far, far less effective than the previous email in terms of conversion. There was no conversations, and there were just a few new sign ups. So how to get our prospects into a conversation? 2. Ask them for a phone call? That’s what most companies do in their cold emails. They ask for a good time for a phone call, which is usually not a bad idea because it’s an invitation to a conversation. That approach has some undeniable advantages, but it has some drawbacks as well. The main advantage is what I described in the previous section about providing a link, namely: if we talk on the phone, we can answer all the questions our prospect has about our company and product or service. We can discover all the doubts they have about our solution, and we can immediately react to all these doubts. Additionally, we can get to know them better by asking them some questions about their needs and pain points. The drawback of asking for a phone call is that we will need a person, or ideally a whole team of people, who will actually talk with the prospects. That is we need a sales team – and having a sales team is not always the case in early stage start-ups. Usually, there is one or two people responsible for contacting the potential customers – and at the same time responsible for a dozen of other tasks in the company. So if we have a sales team, we can definitely go for setting up phone calls. At least from our own perspective. Oh wait, but what about the prospect’s perspective on a phone call? Busy people have tens of phone calls and meetings scheduled for each and every day. Often it’s really difficult to fit into their schedule. And a cold email from a stranger may not suffice to get them cancelling some of their important meetings in order to get on the phone with us – a total stranger. I mean that asking for a phone call in a cold email may be, in many cases, asking for too much in advance. And as Lincoln Murphy rightly points out in his famous 7 Sanity Checks article – we should make sure that in our email we don’t ask for too much. So what should we ask our prospects for instead? 3. Ask them to answer a question? Again, don’t get me wrong, these are all good CTAs. And they will work, for those who are ready to talk on the phone or sign up for a trial. But some of our prospects won’t be ready to jump on the phone. They will want to get to know us better before they decide to talk to us. What to put in a CTA then, to don’t get such prospects scared off? We can always ask a simple question at the end of our message. A question is so self-explanatory – it calls for an answer (which is taking an action after all). We need to be intriguing. We usually tell them what to do. We need to keep in mind that maybe they don’t want to do anything for a person who just cold emailed them. But probably most of them will be tempted to answer a well-asked question referring to an actual problem they have. You can try out all possible CTAs. You can try to predict, on the basis of your target group research, which will work best – to decide what to start from. The important thing to keep in mind is that you send cold emails to initiate valuable relations with your potential customers and/or business partners. And that those potential customers and/or business partners are human beings – just like you are. And just like you, they have their expectations, fears and doubts. Just like you, they always feel they don’t have time. Just like you, they are only interested in starting relations that will be somehow valuable to them. So before you ask your prospect to click a link and sign up for a trial in the first email, think if you would be willing to do so – and think of what would make you eager to do so. Before you ask them to find some time for a phone call, think of how eager you would be to spend 20 minutes of your time to talk on the phone with someone offering you a product or service – and think of what would make you want to jump on the phone. Before you ask them a question, think of what question would make you feel like it’s worth hitting ‘Reply’. Previous postWhat Can We Use B2B Cold Emails for, besides Prospecting? Next postFonts, Pics & Links in Cold Email – Should We Ever Use Them? Appreciate you referencing the guide I put together and the example 🙂 Cheers! These are some really pressing questions and concerns that need to be addressed. Thanks for pointing them out, Cathy! I’d like to recommend our tool at http://www.salesripe.com for those who want to get the ball rolling with your recommended techniques. 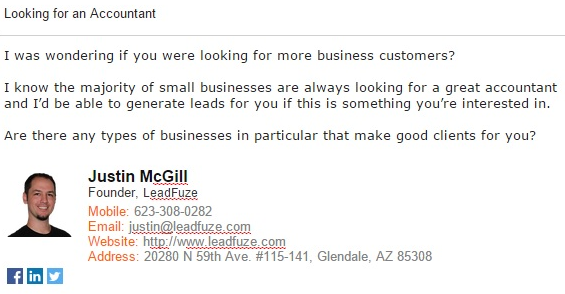 Our tool is great for building your sales and email list so you can put the above tips to use!